Within the human brain, everything is connected with everything and yet there are fundamentally distinct pathways that regulate the species’ basic instinct for survival though crosstalk with physiological processes. For more than three decades, Satya P. Kalra and colleagues have undertaken the challenge of deciphering and comprehending the working of the brain networks that generate, relay and integrate information essential for reproduction and for the instinctual drive for food. Kalra – a member of the University of Florida Brain Institute – is recognized internationally for his research in neuroendocrinology, which is the study of neurons that uniquely produce neurotransmitters and hormones to communicate with other neurons in the brain to regulate several physiological processes. He is credited with discovering the effects of neuropeptide Y, a neurotransmitter that stimulates appetite and regulates reproduction. These pioneering studies, published in 1985, have been cited as classic and republished in their entirety in the Journal of Obesity Research in 1997. Kalra achieved eminence in neuroendocrinology by characterizing several neurotransmitter systems and how disruption in these systems adversely impacted reproduction and appetite. For this insightful and original research he has been invited several times to summarize his research in Frontiers in Neuroendocrinology and Endocrine Reviews, two cutting-edge journals. Kalra has served as a member of the editorial board of Neuroendocrinology, Endocrine Reviews, and Endocrinology. He has been the North American editor of Journal of Neuroendocrinology since 1987. 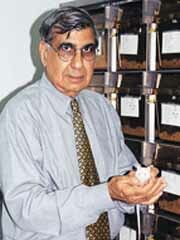 It was for these scholarly accomplishments that he was awarded in 1996 the Faculty Research Prize in Basic Science for Outstanding Achievement and Productivity in Research, University of Florida College of Medicine and the Professional Excellence Program Award for Outstanding Achievements in research, teaching and service at the University of Florida. Currently, his group is developing pharmacological and gene therapy approaches to control weight and obesity.